The Low Cost Carrier Terminal is specifically built at KL International Airport to cater to the growing passengers of the Low Cost Airlines, especially the passengers of Malaysia's first 'no-frills' airline, Air Asia. It is located 20km away from the KLIA Main Terminal Building (MTB). Construction of the LCC Terminal was on a fast track basis beginning June 2005 at an approximate cost of RM 108 million. The operation of the LCC Terminal is supported by the existing parking apron and additional infrastructures such as car parks, surface access, kerbside road and other utilities. This terminal is capable of handling 10million passengers a year and there is scope for further expansion of up to 15 million passengers, if required in the future. 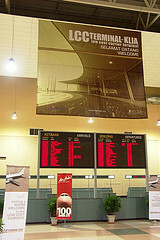 The LCC Terminal was opened for familiarization on 9th March 2006 and will be fully operational on 23rd March 2006. This terminal is managed and operated by Malaysia Airports (Sepang) Sdn Bhd.